On June 29, 1998, Trina Gomez and Max Patlan were working at a Fidelity Financial Institution in Fullerton, California. It was closing time and Max had already locked the front door. Two men – Jason Steward and Harold Bailey – knocked on the front door. Max opened the door after the men told them they were there to make a payment on an account. Inside, Harold pulled out a handgun and Jason pulled out a shotgun. The robbers demanded money from Trina and Max and then absconded with $1,410 in cash and $4,138 in personal checks. Bernard Teamer acted as the getaway driver and the three left and divided up the money. Officers interviewed Trina and Max, but generated no leads other than very generic descriptions of the robbers – one robber was tall and slender wearing a suit, and one was stocky, possibly shorter than the tall robber, wearing a t-shirt and Levis. Officers also collected a gardening glove the robbers had left behind. The following day, officers spoke to Andrew Holguin, an employee at a neighboring auto parts store and determined that the driver of the getaway vehicle was Bernard. Finally, they had a lead. The investigating detective compiled multiple photo lineups (six-packs) depicting individuals who were somehow known to be associated with Bernard and showed them to Trina, Max, and Andrew. In doing so, he did not adhere to several vital rules in compiling lineups. For example, he did not make sure that each suspect in the six-packs looked sufficiently like the “fillers.” He also placed multiple suspects in each six-pack which increases the odds of a misidentification. Guy Miles’s photo ended up in the eighth six-pack. Ultimately, Trina positively identified Guy from the six-pack even though she had already tentatively identified Harold from another six-pack. After she did so, the investigating detective obtained an identification of Guy from Max even though Max had told officers he would not be able to identify the stocky robber. The investigating detective told Max, before showing him a photo of Guy, that an arrest had already been made in the case. Andrew made a positive identification of someone entirely different as the stocky robber and even, at one point, noted that Harold looked familiar. Guy was prosecuted based on these identifications. At trial, outside the presence of the jury, Trina could not positively identify Guy as the stocky robber even when she stood at the counsel table and observed him from various vantage points. Trina specifically said, “I’m not certain that that’s him.” After a recess with the prosecuting attorney, Trina changed her mind and told the jury she was 100% positive Guy was the stocky robber. Max identified Guy at trial, but noted that he looked thinner than the robber he saw. Interestingly, Guy had actually gained 35 pounds from the time of his arrest for the crime and the time of trial. Andrew did not identify Guy as one of the robbers at trial. Guy had a total of nine alibi witnesses, six of whom the judge allowed to testify, who stated that Guy was living in Las Vegas, Nevada, at the time of the charged offense. The witnesses included relatives, neighbors, and his landlord. Guy also presented the testimony of Dr. Scott Fraser who testified to the factors generally affecting eyewitness identifications. Further, DNA results from testing on blood spots from inside the gardening glove left by one of the robbers did not match Guy. Jason Steward could not be excluded from the results. It ultimately took a jury five days of deliberation before finding Guy guilty and even after, at one point, asking the judge what is considered a “hung jury.” Jason and Harold were never apprehended for the crime. Guy was sentenced to 75-years-to-life for the robbery. 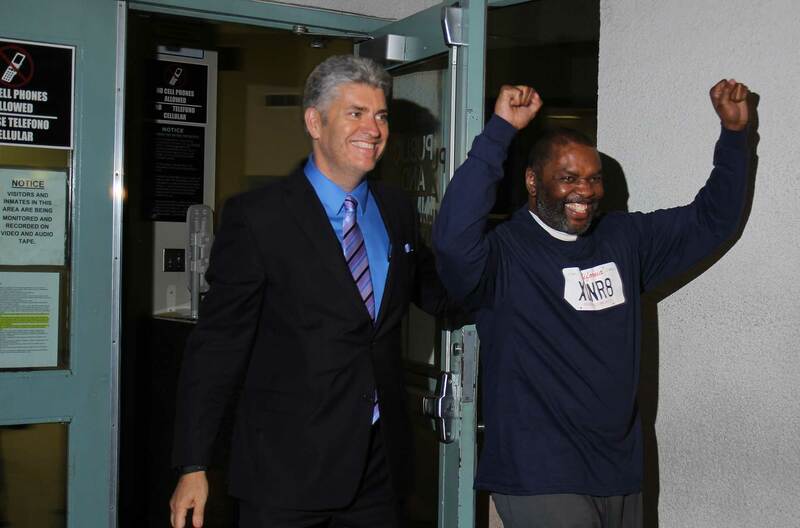 The California Innocence Project (CIP) thereafter commenced an investigation into Guy’s claim of innocence. After nine years of investigation, CIP finally located the three true perpetrators of the robbery – Bernard, Jason, and Harold. They all came forward and confessed to the crime. These confessions were further corroborated by a plethora of new scientific studies in the field of stranger eyewitness identifications, the single leading cause of wrongful convictions in the world, which raised even further doubt about Trina’s and Max’s identifications. Trina and Max even identified Jason Steward as looking familiar, despite the passing of nearly 20 years since the time of the crime. On January 19, 2017, the California Court of Appeal, Fourth Appellate District, Division Three reversed Guy’s conviction, finding new, credible confession evidence would have resulted in a different outcome at Guy’s trial. Facing reprosecution and eager to be home with his aging parents, Guy opted to take a plea deal offered by the prosecution. On June 20, 2017, Miles pleaded guilty to the offense pursuant to People v. West, which allows someone to plead guilty while neither admitting nor denying involvement in the crime. Guy was freed hours later and maintains his innocence.